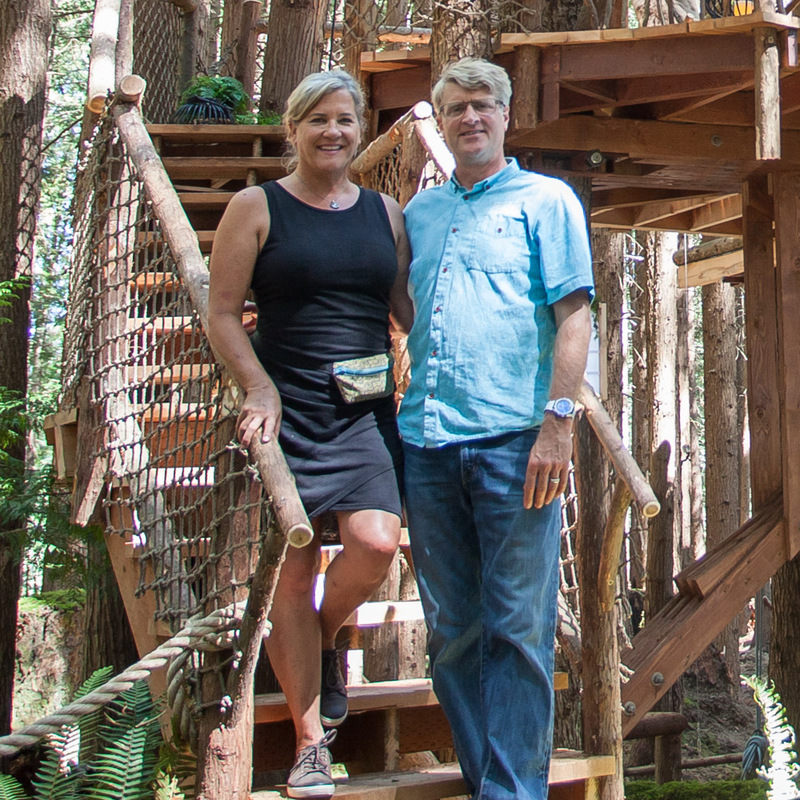 It was a treat to build this treehouse in California for Mike and Pat! With their family tradition of making candy, Mike and Pat dreamed of an arboreal kitchen where their family could gather to pull and twist candy canes around the holidays. This treetop candy kitchen also makes for the perfect place for R&R with two decks, high ceilings, a sleeping loft, bathroom, wine bar, and expansive windows. A long barrel-tress roof rounds out the structure and provides plenty of space for the whole family. Although changes have been made to the treehouse since its completion in 2014, reminiscing about this festive build fills us with joy. We hope you enjoy looking back at this sweet treehouse retreat as much as we do! Metal posts and beams provide necessary support for this 40-Ton treehouse. Pete's design ensures that the structure still feels just like a treehouse as it weaves between the branches of 14 camphor trees. Even Alex couldn't resist the crew's festive spirit while working on this cheerful treehouse! A sturdy staircase leads to the front door. Classic NT&S hog wire railing provides a sturdy barrier without blocking those stunning views of the vineyards below. A live-edge slab bar top balances the modern look of the stainless steel countertops. This kitchen was replete with a plumbed sink, many cabinets, and even a candy hook. The rounded rafters of the barrel-truss roof are visible from inside. The crew added rigid foam insulation on top of the roof to keep from covering up these unique rafters. A ship's ladder leads from the living room to the bedroom loft. The loft is large enough to hold a comfy queen-sized bed - it's the perfect place to rest after falling into a candy-cane-induced sugar coma! Dual decks provide plenty of space to enjoy the treetop views. Tree branches weave through and around the deck and this built-in counter. Thank you, Mike and Pat, for a sweet treehouse build! To stay up-to-date on all things treehouse, follow us on Instagram and Facebook and subscribe to our mailing list below.